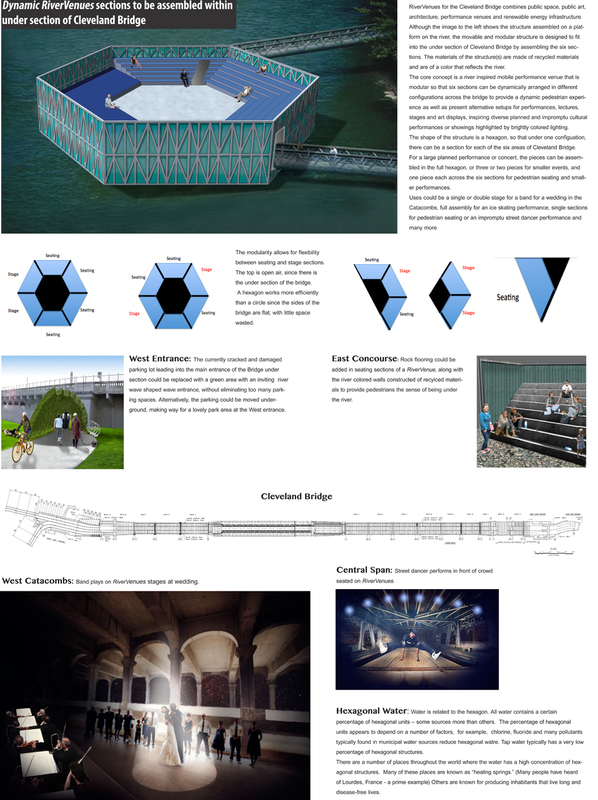 Dynamic RiverVenues combines public space, performance venues and renewable energy. 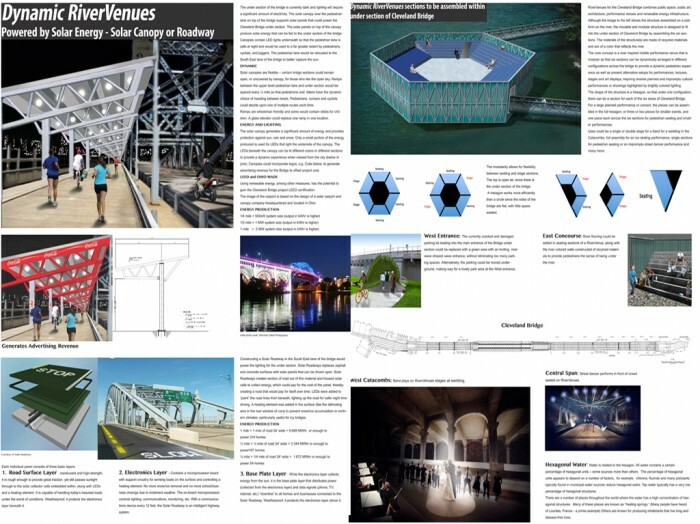 RiverVenues is a river inspired mobile venue that is hexagonal and modular so that six sections can be arranged in different configurations along the bridge to provide a dynamic pedestrian experience as well as diverse setups, inspiring planned and impromptu cultural experiences. For large performances, the full hexagon is used while dynamic section combinations provide smaller venues. The design is inspired by waterÕs unique relationship with the hexagon. RiverVenues is simple, pragmatic and achieved with available technology, utilizing solar energy to power LED lighting in the bridge under section required for safe public use. A solar canopy shelters the upper bridge pedestrian lane and feeds energy to the under section. 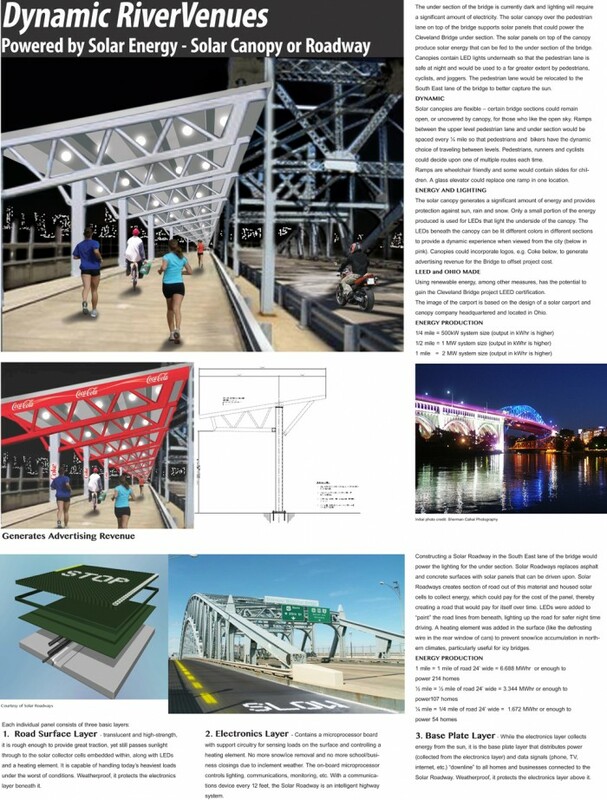 The canopy underside is brightened with LED lighting for pedestrian safety at night. LED lighting is available in many colors. Parts of the canopy be of different colors, providing a more fluid dynamic experience when viewed from the city. Logos on the canopies could generate advertising revenue to improve project financials. The solar canopy can have zero upfront cost via a financial arrangement common in the solar industry, the Power Purchase Agreement (PPA).